So over the weekend I celebrated a good friends Bachelorette party. Aside from beach time, lots of drinks and food there was a lot of talk about beauty. This gem by Urban Decay came up more than once by my friend H who incidentally is a skin care expert at a mega beauty store in NYC. We talked about some skin care things, to be reviewed later this week. Naturally after all of this beauty talk I stopped in Sephora on my way home from the Bachelorette party craziness. 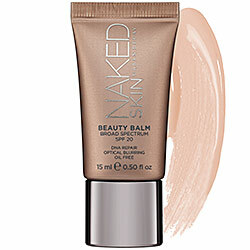 While I was waiting to check out I saw a travel size version of the Urban Decay Naked Skin Beauty Balm just sitting by the counter. I picked it up because I’ve been super curious about trying it and it was not as expensive as the full size version so I felt you know, what the hell. My recent foundation-ish loves have been getting too heavy for me to wear as the temperature rises. While they are great for cooler weather, the humidity just makes me feel like I am wearing a mask. Super gross. So I’ve been wearing it for the last two days in place of my other foundations. I even wore it on a plane trip to Chicago, I mention this because after flying my face always feel so gross, this time not so much. I got stuck in an airport with cancelations and mega delays and I still didn’t feel gross. Its super light and provides very minimal coverage, so you will have to use concelaer to cover up spots. But even though the coverage is less than a tinted moisturizer it does this thing that makes you look better than you did before you put it on. Its not heavy and I think it controls oil too because like I said my face felt great even after a day of flying. Win win. Summer “foundation” problem solved.